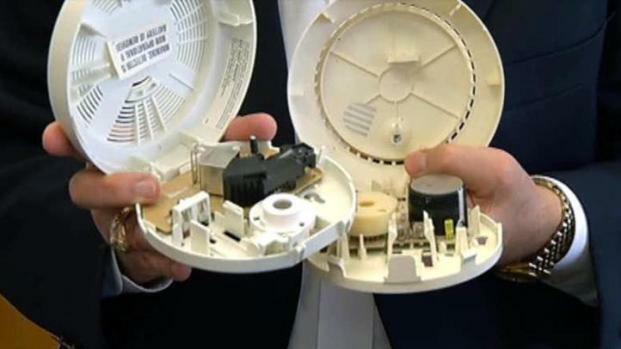 Smoke alarms can mean the difference between life and death, but not all smoke detectors are alike, according to an NBC 5 investigation. There are two different types of smoke alarms on the market -- ionization detectors and photoelectric detectors. Most Americans have ionization detectors, but tests in the last decade have shown they don't perform as well as photoelectric detectors in slow, smoldering fires. "Ionization smoke detectors are too slow in certain fires," said Don Russell, a Texas A&M professor of engineering. "They won't go off in some fires, and that creates a danger for the public." Smoke alarms can mean the difference between life and death, but not all smoke detectors are alike, according to an NBC 5 investigation. This story was published November 10, 2011 - 1:58 a.m.
Russell, one of the nation's leading experts on smoke detectors, has conducted hundreds of tests on smoke alarms. He said he has been concerned for years about fires that happen at night when people are asleep and the air in the home is stagnant. "That's the insidious, dangerous fire, and that's where photoelectric works much better than ionization," Russell said. NBC 5 watched a demonstration of eight smoke detectors in a fire training center in rural Somervell County. The eight detectors were purchased at popular retail stores in North Texas. They included readily available models from First Alert/BRK and Kidde, two leading alarm manufacturers. Somervell County Fire Marshal Dwayne Griffin and James Craft, assistant coordinator for Tarrant County College's fire training center, supervised the demonstration. Russell consulted with Griffin by phone on how to best replicate a slow, smoldering fire. Four alarms, including two photoelectric and two ionizations, were used in the first demonstration. Griffin used a soldering iron to ignite a couch about 15 feet from the detectors. "We're just going to lay it in right there," said Griffin as he put the iron into the couch. "We're concerned about the slow burning, slow smoke area inside of a home." The iron immediately began to smolder. The couch was made of polyurethane, a common product found in home furnishings in recent decades. As the room filled with smoke, Griffin put on a breathing apparatus. The first photoelectric went off 19 minutes and 45 seconds into the demonstration. Within seconds, the second photoelectric went off. The first ionization alarm sounded 22 minutes into the demonstration. As the room continued to fill with smoke, the couch caught on fire. The second ionization detector went off 28 minutes in. "It wasn't until [the] free-burning stage [when] it was completely unsurvivable that the fourth detector, which was the No. 2 ionization, went off," Griffin said. Somervell County fire Chief Mark Crawford, who came to watch the demonstration, said it surprised him. "I had no idea there was such a difference between the two detectors," he said. A second demonstration had similar results, though the smoldering developed more slowly. Once again, two photoelectric and two ionization alarms were installed in the demonstration room, and Griffin put the iron between two couch cushions. None of the detectors had gone off at 25 minutes in. "He just went on air," Craft said while watching the demonstration through Plexiglass. "It's hard to believe smoke's up there on all of them." The first photoelectric sounded at 33 minutes. The second photoelectric went off seconds later. More than 10 additional minutes went by before the two ionization alarms sounded. "When the ionization started sounding, you could not see to get out of your home," Griffin said. "It's an eye-opener, for sure." All of the smoke-alarm manufacturers used in the demonstration make ionization and photoelectric detectors, as well as dual-sensor alarms. Dual-sensor alarms are considered the best protection a homeowner can have to escape smoldering and flaming fires. "Smoke alarms save lives. According to the National Fire Protection Association (NFPA), the number of U.S. home fire deaths has been cut by about half since the mid-1970's, when smoke alarms first became widely available. A fire's very nature makes it unpredictable. Because no one can know when a fire will occur or what type of fire they will have in their home, virtually every recognized fire authority and safety expert -- including NFPA, the U.S. Fire Administration (USFA), Consumer Product Safety Commission (CPSC) and Underwriters Laboratories (UL) -- recommend having both photoelectric and ionization alarms for optimal protection against flaming and smoldering fires. Kidde supports and states this recommendation on its packaging, website and in its owner's manuals. Every Kidde smoke alarm -- regardless of technology -- must pass identical tests in order to meet the current smoke alarm performance standard, UL 217." "First Alert cannot comment on product testing done by third parties. Test results can be affected by many factors and how the test was conducted. Test results are affected by product placement, the nature of the fire, air currents, distance, air temperature, humidity, and many other factors. All relevant scientific studies of smoke alarms recognize that ionization and photoelectric alarms may sound at different times depending on the type of fire. However, these same studies found that either photoelectric or ionization alarms provide adequate time to escape in most fires. First Alert products are subject to rigorous internal testing on a frequent basis. We also meet or exceed standards set by the American National Standards Institute (ANSI) / Underwriters Laboratories. The ANSI/UL's standards result from stringent, independent testing and input from various interest parties, including fire services and governmental agencies. That testing -- and the resulting standards -- is what consumers should look to in judging product quality." The Underwriters Laboratory, the standards writer for smoke alarms, is considering making its smoke-alarm tests much more stringent, NBC 5 has learned. "The goal will be to challenge smoke alarms to better detect fires starting from both slow- smoldering and fast-flaming scenarios," the UL said in a statement. "UL believes this will help address nuisance alarms and challenge the devices to trigger faster than products currently on the market." UL's advisory panel is expected to take a vote on new standards in the next six months. Consumers can do their own homework by reading smoke alarm labels before buying one. Smoke alarm packaging typically states if the product is an ionization or photoelectric detector. People can look on the packaging for an "I" for ionization or "P" for photoelectric. Dual alarms will have both symbols on the box. Ionization detectors use a small amount of radioactive material to create a small electric current between two plates. The alarm sounds when smoke enters the chamber. Ionization alarms are more sensitive to smaller particles of smoke found in flaming fires. The technology has proven to be not as effective with the larger particles found in smoldering fires. Photoelectric technology uses a beam of light and is more sensitive to larger particles entering the chamber. After spending more than a decade conducting tests and seeing results first hand, Russell knows what kind of protection he wants for his own loved ones. "I want to know the earliest possible warning of any fire in my residence if I have my grandchildren sleeping in a bedroom down the hall," he said. "To get the fastest possible warning of a fire, you must use photoelectric technology at least by itself or in concert with ionization technology."